Our Business | Kokusai Kogyo Co., Ltd.
We have continued to push the boundaries of geospatial technology to create ever more accurate maps, essential for developing social infrastructure and nation building—the backbone of economic growth. We are providing total solutions that merge our geospatial and urban planning technologies and utilizing our disaster prevention and disaster risk reduction expertise to rebuild Japan’s social infrastructure with renewable energy sources and to create safer, disaster-resistant communities of the future. Kokusai Kogyo actively contributes toward the realization of our Group Mission: "Save the Earth, Make Communities Green." 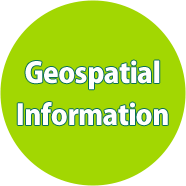 Here are some examples in the virtual city how GIS (Geographic Information System) helps in our everyday life.